Over 130,000 kg of tomatoes. La Tomatina is widely considered to be one of the world's quirkiest - and most raucous - festivals. On the last Wednesday of August every year, the otherwise sleepy Spanish town of Bunol is overrun by people who've travelled to partake in what is, essentially, one big food fight. 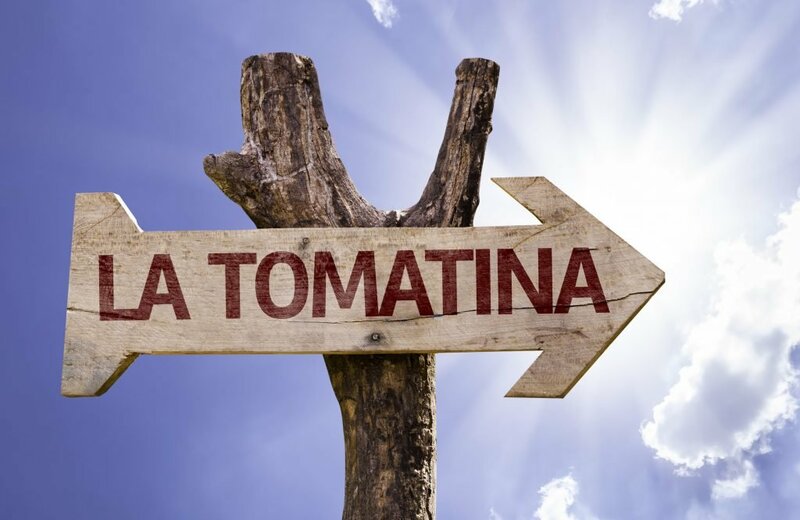 If you're planning to go to La Tomatina this year for the very first time, we've put together this guide that will make you feel completely prepared. From the practical information to top tips from travel experts who've experienced the event themselves, read on to ensure you'll have an amazing La Tomatina. The crowds at La Tomatina. Image credit: Graham McLellan. Although this may just appear to be an excuse to chuck tomatoes at other people, La Tomatina has been around since 1945. Its beginnings are a matter of debate, but La Tomatina supposedly started when there was some disagreement involving a group of youths attending a parade in Bunol. A market stall selling vegetables was nearby... and, well, you can imagine what happened next. Since then, the festival has undergone many changes. It was even banned in the 1950s, although its popularity soon had people pelting each other with tomatoes once again. From the 80s, the tomatoes have been provided by the government. In 2015, La Tomatina will be celebrated on 26 August. It's a ticketed event, meaning that only 20,000 lucky people get to be part of this year's festivities. The venue for La Tomatina is Bunol's Plaza del Pueblo. Festivities begin here at 10am with the 'palo jabon'. 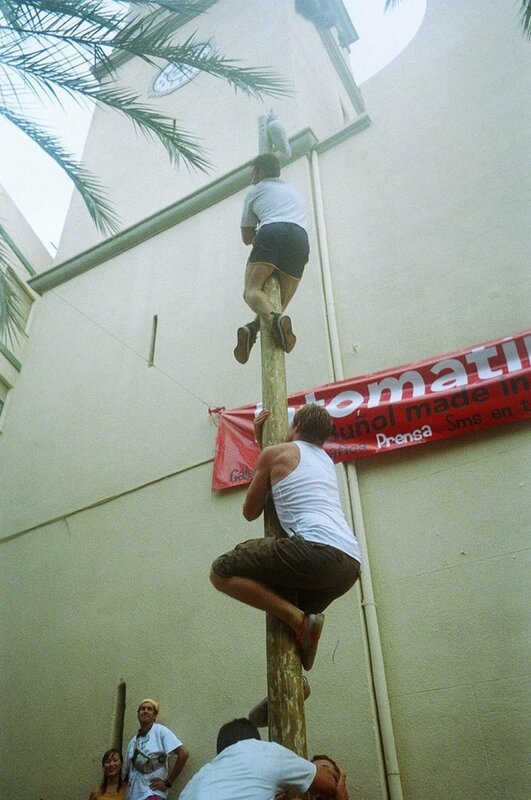 This will involve spectators attempting to climb a two-story, greased pole in a bid to get the ham that's perched on top. This gets very competitive so make the climb at your own risk! The Palo Jabon! Image credit: Graham McLellan. Just before 11am, a number of trucks will arrive - and these will contain the overripe tomatoes. At 11am sharp, there'll be a shot. That signals the start of the tomato fight. After an hour of tomato-throwing frenzy, another shot will be fired at 12pm; and so, another La Tomatina will come to an end. There'll be plenty of events happening before and after the main event, though, so there'll be plenty of parties at which to continue the celebrations. When you're about to throw a tomato, make sure you squash the tomato in your hands beforehand - getting hit with an intact tomato can hurt! Consider booking your accommodation in Valencia (38 km away). There are plenty of transport links to Bunol from here, and this is where most of the before- and after-La Tomatina events will be happening. Invest in some googles. Tomato juice in your eyes is not a pleasant sensation. Plan your journey there and back. Public transport to the main venue can become busy in the hours leading up to the fight, so be prepared to have an early-morning wake up to make sure you don't miss out because of a packed train/bus. Bring a camera. 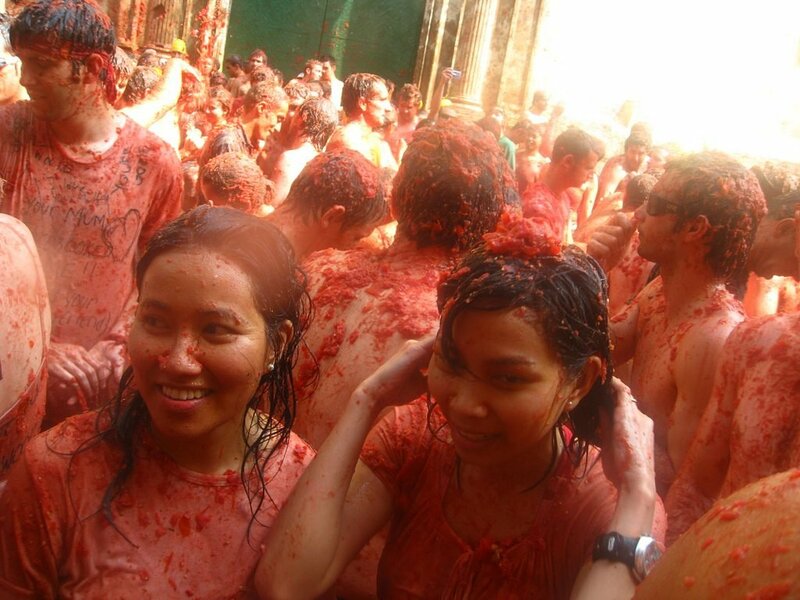 This is the most common dilemma for La Tomatina - to camera it or not to camera it. We say take the camera but make sure it's an inexpensive one and - for added protection - put it in a clear plastic bag. If you're lucky, you'll be able to take photos without any water damage. Wear your best clothes and shoes. In fact, only wear stuff that you're happy to throw away afterwards. Wearing white is popular at La Tomatina and you should wear closed shoes as opposed to flip-flops! Bring too much. Just take along the absolute essentials, unless you're prepared to have your possessions damaged. Your essentials should be: some cash, a change of clothes (you won't be allowed on buses/trains if you're covered in tomato), your ticket to La Tomatina and a small towel. As an added bonus, you can hire a locker before the event. Just stand there! Once you get into the main area for the tomato fight, move further down the thoroughfare so that you can be in the middle of all the action. Forget to arrange a meeting point. If you're going with a group of friends, it'll be very easy to get split up. Arrange a meeting point beforehand so you know where to go if you lose sight of your pals. Try to get a better view. If you try to climb up any wall or gate, you're guaranteed to become an instant target for a steady stream of tomato missiles. Unless that's what you want! The aftermath. Image credit: dahon. Skip looking for accommodation in Bunol and stay in Valencia instead. Bunol is a sleepy town and doesn't offer much choice to travellers. Accommodation is plentiful and cheap in Valencia. 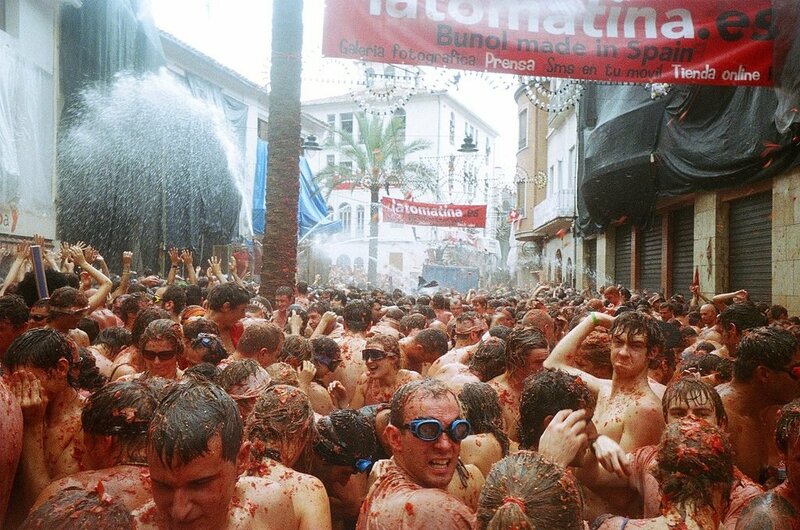 Moreover, most of the Tomatina after-parties take place in Valencia. Get there early! They close off the streets when they get too full and you definitely don't want to miss out! Show up in goggles and clothing that you are willing to throw away after the fight. Wear a swimsuit underneath, and be prepared to get up close and personal with thousands of rowdy tourists! Get your transportation in order!! You'll want to get there before 9:00 if you want to be in the epicentre of tomato-fighting goodness. Once you've managed to wash out all of the tomato from your hair, make sure to take the time to explore the city of Valencia. From eating local delicacies at Mercado Central (one of Europe's largest markets) to taking in the city's historic attractions to visiting the futuristic City of Arts and Sciences, Valencia has something for everyone. Feeling better equipped for your first La Tomatina? Take the next step by checking out our hotels in Valencia and Bunol.